Ever since the ongoing armed rebellion in East Ukraine began the beltarian reason.com has busied itself with relaying the war propaganda of Washington which is backing the Kyiv government against the rebels. It would be unfair, however, to claim that is all it has done, because aside from transmitting poor American-made propaganda it has also relayed some equally poor propaganda from Russia. Doing research on a related topic, I accidentally stumbled upon a June 11th blog post there titled “Pro-Russian Separatists Are Flying the Confederate Flag. Why?“. 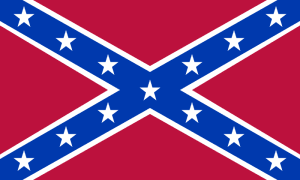 In the piece the Reason contributor Zenon Evans takes at face value the claim of a Moscow Times article by Alexev Eremenko (“Ukrainian Rebels Channel U.S. Confederates“) that one of the flags that the Ukrainian rebels in Eastern Ukraine’s Donbass region are using is based on the flag of the Confederate States of America. Tellingly, although Evans fails to think of a reason why the rebels in Donbass would rally behind the Confederate flag that is not utterly bizarre, he nonetheless fails to consider the possibility that this reported fact is, in fact, disinformation. Why would he? After all, it serves to inter-connect so many of those he dislikes. The confederates are evil, conservative Americans who disagree with Washington’s foreign policy are evil, any “pro-Russian fighters” are surely also evil. It makes perfect sense in the warped, naive, paranoid and feeble mind of Zenon Evans that these disparate groups would gravitate to each other and send each other coded messages. Somehow Evans is willing to imagine that thousands of fighters in Donbass are willing to risk their life and limb under a “loaded American artifact,” rather than something relating to their own history, as a gesture and an appeal to American stormfronters and The American Conservative. Why, you would almost think Evans was looking to smear the conservatives and Ukrainian rebels alike by doing a little old fashioned guilt by association. Unfortunately for these designs, there is a little thing I like to call a “30 second Google search” that gets in the way of Evans’ hypothesis. It turns out that the flag used by the “pro-Russian separatists” is actually based on the Russian naval jack. Imagine that! “Pro-Russian separatists” are flying a flag grounded in Russian, rather than American, history. Why, I’m in shock! 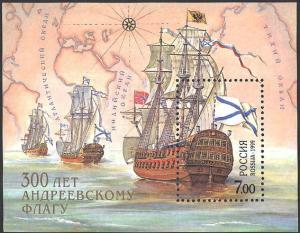 It turns out that in the early 1700s, Peter the Great built the first modern Russian navy and drew up the flags for it. 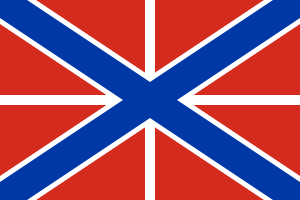 He chose the St. Andrew’s cross in blue on white background for the Russian naval ensign, but combined the St. Andrew’s cross with a thin St. George’s cross in white on red background for the Russian naval jack and fortress flag, thus producing a mainly red flag that is dominated by a large St. Andrew’s cross in blue. Peter the Great was a famous westernizer of Russia and probably drew inspiration from the flag of Great Britain, design-wise. Aside from that, Saint Andrew is the “Apostle of Rus,” the early medieval state of all the East Slavs that was ruled from Kyiv but stretched over much of today’s Ukraine, Belarus and European Russia. Meanwhile St. George is the patron saint of Moscow and is featured atop a horse on its coat of arms, which has been an integral part of the Russian coat of arms over the centuries. 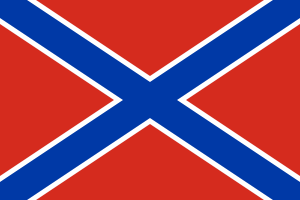 So then, what the rebels in Eastern Ukraine did was take inspiration from the Russian naval jack and fortress flag, but stripped it of the St. George’s cross which is more relevant to Moscow and Russian statehood, but kept the St. Andrew’s cross which is equally relevant to Russians and Ukrainians alike. Despite the naiveté of Zenon Evans, the Eastern Ukrainian rebels are not flying American Confederate colors. Rather, they are flying colors that have been hoisted since 1701 by the bases of, and since 1721 on the bowsprits of the vessels of, the Russian navy. And to think, a 30 second Google search was all that Evans needed to prevent coming off as the dunce, ignoramus, smear artist and hack that he is! According to the best available study on the subject Germany lost 5.3 million military men to World War II. Of these, 340,000 were lost in Western Europe, 150,00 in Italy, 16,000 in Africa and up to 225,000 on the seas and in the air over Germany. Additionally the Germans lost 1,230,000 dead in the final battles in Germany of 1945, of which Overmans estimates about one third or 410,000 were inflicted by the Western Allies. Taken together the Germans lost just under 1.2 million military men to the Western Allies, chiefly the Anglo-Americans. Meanwhile in the course of the war between 360,000 to 460,000 civilians died in the Anglo-American strategic bombing campaign against German cities and towns. For every three German soldiers the Anglo-Americans also killed one German civilian (or sometimes a forced foreign laborer or an allied prisoner of war). Nor is this the complete tally of Anglo-American bombing in WWII Europe. An estimated 60,000 civilians were killed in the bombing raids over France and just as many in Italy. 20,000 more were killed in allied bombing raids in the Low Countries. Theoretically the campaign against German cities was “strategic”, but the raids over German-occupied territories were only “tactical”. According to the architects of Combined Bomber Offensive, civilian deaths in Germany were a positive outcome of the raids. They would diminish German morale and aid the Allied cause. On the other hand any civilian deaths caused in German-occupied countries were only tangential to what the strikes were supposed to accomplish. In practice it did not make a whole world of difference. Altogether the Anglo-American bombs took the lives of roughly 550,000 civilians across German-run Europe. In Japan the USAAF killed 100,000 people in the March 9-10th 1945 raid on Tokyo alone, and then 120,000 people in the atomic bombing of Hiroshima and a further 60,000-80,000 in the atomic bombing of Nagasaki. Altogether the strategic bombing campaign against Japan likely killed between 400,000 and 500,000 people. Taken together, the American and British bombing campaigns over Japan and German-occupied Europe killed about 1 million non-combatants. How easily can it be argued that a force which, mainly in the space of just over a year (between mid-1944 and mid-1945), burns to death or collapses under the ruble 1 million civilians, children and women included, is a force for good? In the course of the Second World War the Anglo-Americans actually inflicted more enemy civilian deaths than the loathed Stalin. Around 1 million Germans and Japanese perished under Anglo-American bombs. Meanwhile the Soviets chiefly caused German civilian deaths in the expulsion of millions of Germans from parts of eastern Germany that were annexed to Communist Poland and the USSR. Nearly 500,000 of these expellees died in various circumstances. Additionally, in the course of the Soviet-German conflict about 1.5 million of the Soviets’ own citizens perished as a result of Soviet state repression. Of these about 1 million in the gulag, 0.3 million from in the ethnic-based deportations of “enemy peoples” and 0.2 million executed by civilian courts, the secret police and military tribunals. On the other hand, in that very same timeframe the British Empire callously presided over the deaths of about 3 million of its colonial subjects in the banal and avoidable Bengal Famine of 1943. In 1942 the weather and the Japanese capture of neighboring Burma ensured there would be some manner of food crisis in Bengal. In of themselves, however, the Japanese and a severe cyclone were not sufficient causes for the catastrophic famine that would follow. Disaster struck when the British, sensing a crisis, intervened to secure food for the colonial administration, troops and industries in the cities, that is the sectors of society which they they deemed vital for the war effort. First they tried price controls and forced requisitions, but quickly abandoned both and instead issued local merchant companies with vast quantities of newly-printed fiat currency and authorized them to buy up as much food as humanly possible for British stocks. British policy filled up state granaries (where some of the food would end up rotting away), but drove up prices and sucked out food from the countryside. The landless peasants of Bengal could not compete with the purchasing power of the British (who could issue new currency) and were left unable to procure even enough food to keep their families nourished. Even once the extent of the disaster became clearly visible the British continued to export food from India as a whole and never contemplated a relief effort, though there was food enough in the Empire to continue to build-up food stocks in Britain and the eastern Mediterranean. In the course of the Second World War both the British and the Americans on the one hand, and the Soviets on the other, carried out unjust and collectivist policies that extinguished the lives of millions of non-combatants. What is more, both sides, the Soviets and the Anglo-Americans, caused the deaths of innocents on roughly the same order of magnitude. If anything in this particular timeframe the Soviets lagged somewhat behind the Western Allies. Naturally, neither of them can hold a candle to Nazi Germany. In the course of World War II the Germans killed 5.7 million in the Holocaust, nearly 1 million in the Siege of Leningrad, more than half a million in anti-partisan reprisals in the Soviet Union and caused perhaps a further 7 million deaths of malnutrition and disease in the USSR. An additional 3 million Soviet prisoners of war died in German custody most of whom after being intentionally left to starve to death. Massive losses were further inflicted in occupied Yugoslavia, Poland and Greece. Most shockingly the Third Reich had intended much worse than it had accomplished. Had they succeeded in rapidly conquering the European portion of the USSR, the Nazis had planned to starve tens of millions of its inhabitants in the first year of the occupation alone. German victory in World War II would have spelled the death of incomparably more people than did its defeat at the hands of the Soviets and the Anglo-Americans. It is only natural to breathe a sigh of relief that Nazi Germany did not come out victorious from the Second World War. This, however, does not mean there was anything particularly exalted or praiseworthy about those who did come out as the victors from the global slaughter of the 1940s. They too were perfectly willing to carry out collectivist policies that were utterly contemptuous of human life and brought about the deaths of hundreds of thousands of “enemy civilians”, their own citizens and their colonial subjects in terror bombings, forced labor camps and avoidable, man-made famines. The only saving grace of the objectively downright terrible Soviets and Anglo-Americans was that Germany under the Nazis somehow succeed in being even far worse. That is, they only looked good by comparison, but on its own their track record was also horrendous. That is the great tragedy of the biggest armed conflict that had ever struck human kind: after so much human sacrifice and losses the victory still did not belong to morality, humanity and freedom, but to frightening state powers with the deaths of millions of innocent individual human beings on their conscience. On the one hand there was Stalin’s USSR of which little needs to be said here. On the other there were the British Empire and the United States whom in the course of World War II in terms of killing innocents and presiding over mass death taken together easily kept up with and even exceeded Stalin. 1 According to Rüdiger Overmans, Deutsche Militärische Verluste im Zweiten Weltkrieg (München: R. Oldenbourg Verlag, 1999). 2 Ethnic Germans were also expelled from Czechoslovakia and Yugoslavia but this had comparably little to do with Moscow. An older estimate of 2.2 million deaths due to the expulsions of the Germans also exists, but since new research by German scholars such as Ingo Haar and Rüdiger Overmans this figure is no longer tenable. It has been shown the 2.2 million figure actually represents the total demographic loss of German speakers and German citizens from the affected areas. The 2.2 million figure for example presupposed there were 270,000 dead among Germans expelled from Czechoslovakia. In fact a joint German-Czech commission of historians found there were actually 15,000-30,000 such deaths. The difference is made up of categories such as the Germans from Sudentenland who died in German armed forces (160,000), the Sudetenland German victims of Nazi repression against Freemasons, Jehovah’s Witnesses and gay men, the Sudetenland Germans murdered in the Nazi euthanasia programs and so on. Ingo Haar estimates total deaths resulting from the expulsions at between 500,000 and 600,000. 3 Some 8.5 million families in Bengal owned too little land to be able to feed themselves from what they produced. They supplanted by buying food from what they earned working for wealthy landowners. For an excellent account of the famine and its context see Madhusree Mukerjee, Churchill’s Secret War: The British Empire and the Ravaging of India During World War II (New York: Basic Books, 2010). My review of the book may be read here. 4 The number of prisoners of war who perished in Soviet custody is contentious. Research conducted by the Russian sholar Krivosheev suggests there were 360,000 documented deaths among German prisoners of war and an additional 90,000 undocumented deaths in transit for a total of 450,000. G.F. Krivosheev, Soviet Casualties and Combat Losses in the Twentieth Century (Pennsylvania: Stackpole Books, 1997) 276. Overmans meanwhile believes there were many more undocumented deaths for a total of up to a maximum of 1 million German POW deaths in Soviet custody. Additionally there were tens of thousands of deaths among Japanese, Italian, Romanian and Hungarian prisoners of war in Soviet hands. Are There Any Bleeding Hearts Here? The author of the passage is one Fernando Teson who is such a “bleeding heart” that he has made it his life’s work to try to sell war to libertarians under the touchy-feely guise of “humanitarian intervention.” He had previously backed the American invasions of Iraq and Afghanistan, but is now wiser for the experience and is having second thoughts about supporting the same in Syria. So in Teson’s reflection what was the problem with American invasions of Iraq and Afghanistan? Apparently it is the fact Iraqis and Afghans turned out to be a bunch of ingrates who did not deserve to be liberated in the first place! Such people should rather be left alone to “lead their miserable lives,” but nonetheless threatened not to get any ideas about attacking Americans. Let us just say that “bleeding heart” is not at the top of my list of what I would call the author of such a boorish passage. A different part of the body would come to mind far sooner (it starts with the letter ‘a’). The actual problem with the American war in Iraq was not that Iraqis were morally deficient and thus incapable of gratitude. The actual problem was that it was an empire-building exercise that ended up killing some 500,000 people (albeit of the ingrate Iraqi kind) and was thus amoral from the start and rotten to the core. 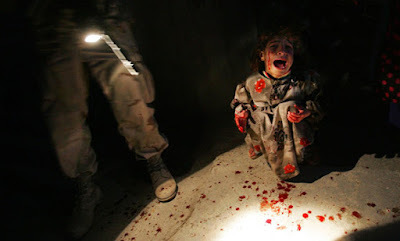 It did not help Iraqis at all, but instead tore apart and devastated their already traumatized country. It takes quite the anti-Iraqi jerk not to see this. The likes of Fernando Teson tried to sell us the Iraq invasion on humanitarian grounds, but one wonders why anyone in 2003 would think Iraqis would have to be subjugated to American rule before they could be helped? Was it not the case that at the time millions of Iraqis would have seen a drastic and immediate difference in the quality of their lives if only the comprehensive UN sanctions against Iraq were repealed? The cause of a great humanitarian crisis in the country could have been eliminated totally without the need for the US armed forces to invade a sovereign country or exercise power over foreigners in their own land. So much could have been done completely without the need to bolster the Pentagon’s standing and budget, hand over magnificent earning opportunities to Halliburton or spread American influence in the Middle East. Indeed reasons such as these may have been far more important to those who planned and ordered the invasion than any notion of doing a favor to the Iraqis. However, without the Iraq Invasion more than simply an apparent opportunity to further entrench American hegemony would be missed. The major attraction of humanitarian interventionism is that it offers a glorious opportunity to engage in self-flattery. In 2003 the humanitarian interventionist narrative made Iraqis into pitiful victims of a foreign murderer-dictator and his totalitarian Arab regime. This made the Westerners involved in the invasion into supposed selfless heroes risking their own lives and spending their own means to save Iraqis from their own state. Such self-flattery! In fact the truth was almost the exact opposite. In the 1991 Gulf War the international coalition assembled by the United States first thoroughly destroyed parts of Iraqi civilian infrastructure in air strikes. After that it pushed through the adoption of the most comprehensive trade sanctions instituted in the 20th century at the UN. With Iraq starved for capital and anyway prohibited from importing much of what it needed, the infrastructure could never be properly repaired and the country was kept in a state of a permanent humanitarian crisis. 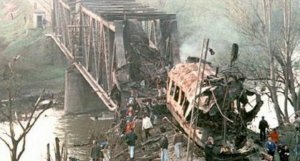 In the course of the decade the increase in mortality that was caused by the combined effect of the 1991 bombing campaign and the long-lived sanctions regime took the lives of hundreds of thousands of people. Children were particularly vulnerable. Child mortality doubled from where it had been in 1990 to reach the levels not seen in Iraq since the early 1960s. By 2002 the United States had already been strangling Iraq for over a decade and had in all likelihood already caused the deaths of more Iraqis than Saddam Hussein had. Now it was amassing its troops in Kuwait and Saudi Arabia in order to strike against Iraq and subdue it by military force, ostensibly in part for the good of the Iraqi people who would be freed of tyrannical dictatorship. The ensuing invasion resulted in a war that ultimately killed more than 500,000 of the Iraqi people and forced millions from their homes. The Iraq Invasion was in fact profoundly anti-humanitarian. It was accompanied by and caused enormous levels of misery, destruction and trauma — as was only to be expected of an invasion conducted by a power that had already demonstrated a shocking level of disregard for Iraqi suffering and death prior to the attack. Iraqis have every reason to dislike the United States which was the major cause of their woes for over two decades. Rather than accept this fact Fernando Teson would like to pretend they are morally inferior ingrates. But how is this possible when Fernando Teson is such a “bleeding heart” that in 2003 he backed the United States to invade Iraq in order to save Iraqis from Saddam Hussein? A hint may be found in that as stated humanitarian intervention rarely has anything to do with humanitarianism. It is instead capturing the opportunity to engage in self-flattery. Therefore there is no contradiction in the fact someone who thinks so little of Iraqis would have at one time argued for the need to save them from their government. Even jerks like to give themselves a pat on the back sometimes! It also explains why humanitarian interventionists like Teson show so little concern for what their wars actually bring about. Once you are in the business of self-flattery the reality of the situation simply does not matter all that much anymore. Whether you conduct an actually humanitarian military intervention that saves lives, or else one that screws up the country you intervene in does not matter all that much. You can always lie to yourself about what took place and give yourself a pat on the back anyway! I propose Libertarians should be more sensitive than that. Also, preferably they should not refer to themselves as “bleeding hearts” — such self-flattery! And in Teson’s case — unearned! 1 According to the University Collaborative Iraq Mortality Study published in the PLOS Medicine journal in 2013. The study concluded there were about 500,000 excess deaths in Iraq 2003-2011 attributable to the war. Of these two thirds (333,000) were violent deaths and one third (167,000) were indirect deaths due to deterioration of living conditions brought about by occupation and war. Data from one survey method (household reports) of the study suggests at least 35% (117,000) of the violent deaths were inflicted by the US-led coalition forces. Data from the second survey method (sibling reports) suggest US-led coalition forces inflicted at least 27% (90,000) of all the violent deaths. Additionally either at least 1% (3,000) or at least 3% (10,000) were killed by the forces of the new American-backed Iraq government. Either at least 11% (37,000) or at least 8% (27,000) were killed by criminals and criminal gangs unleashed in the chaos and desperation. Either at least 32% (107,000) or at least 44% (147,000) were killed by the various Sunni, Shia and Kurdish militias. According to the responses given in the household reports women accounted for 10.5% (35,000) of the violent deaths and coalition forces were the single biggest cause of violent deaths for women. The first thing that jumps out about the recent Jeffrey Tucker “Against Libertarian Brutalism” essay, which continues to make waves on the libertarian scene, is its confusion. With all due respect to Mr. Tucker, his argument is less than fully clear throughout and threatens at times to cross over into complete incoherence. For example, Tucker explains that ideological brutalism is the tendency to push the most fundamental parts of an ideology to the foreground, coupled with a categorical refusal to go beyond these (that is to qualify, nuance or compromise them in any way). Yet at the very same time Tucker proposes a libertarian brutalist will be drawn to defend an arrangement where a “fundamentalist sect” takes over a town and “forces women into burka-like clothing.” But why should this be so? In actuality, since non-aggression is a core libertarian principle, anyone who is dedicated to fundamental tenets of libertarianism can not but oppose such coercion against women. It is then logical to expect that people who are as devoted to core libertarian principles as Tucker’s “brutalists” supposedly are, could only surface among the strongest and most dedicated opponents of such coercion on the part of the aggressive sect. Tucker likewise states that liberty “protects human rights of all against invasion”. What is more he counts this as a worthy reason to battle for liberty. In other words he appropriates this motive for the “libertarian humanitarians” who want to bring about liberty for good, positive reasons. Yet there is no escaping the fact that “protecting rights against invasion” is very much a core libertarian tenant, one that Tucker’s brutalists, if they are to fit his definition at all, have to be unflinchingly devoted to. So on the one hand Tucker salutes libertarians (supposedly “humanitarians”) who want to bring about a libertarian system specifically because they are devoted to rights and non-aggression. But on the other he riles against “brutalists” who emphasize only the value of fundamental libertarian principles — albeit the respect and the protection of the rights of human beings is precisely one such core libertarian principle, and perhaps the defining one! Tucker damns “libertarian brutalists” because they aspire to liberty so that they may freely live out their lives as boors. He specifically singles out racists, anti-Semites and misogynists, but he could just as easily be talking about people who are intolerant of believers or prejudiced against proletarians. In Tucker’s view it is not quite enough for libertarians to want to bring about a libertarian system. He asserts that because liberty allows for a great many practical outcomes that may be inspiring as well as ugly, it is likewise important what the supporters of liberty intend to do with their freedom. It should be first noted that libertarianism is an extremely poor choice of political philosophy for a boor worth his salt to pick up and champion. As statists, boors who despise, say, gays and hillbillies may work to pass repressive laws against them or conscript them into a terrible war. As a libertarian they will be striving to eliminate all political power and by extension working to end systemic injustice against everyone, including individuals from the segments of the population they may personally hold in contempt. It seems then that as long as there are boors and bigots it is highly desirable that they be libertarians. In fact, none are more likely to profit from the libertarian orientation of bigots than the very people they are bigoted against. They will have lost a potentially significant enemy and won a functional champion of their rights. Additionally we should note that boorishness is only one of countless human failings. We could also name timidity and cowardice, a lack of generosity, excessive judgmentalism, hedonism and miserabilism and countless others. Therefore, as long we are bringing matters of taste to the forefront why stop at demanding that libertarians privately do not give in to boorishness? What about other libertarians who dress badly, do not give out candy for Halloween or have an atrocious taste in music? What about libertarians who lack the personal courage to rush to the aid of their neighbors in an emergency such as a fire, or others who would never contemplate dedicating a penny to charity? Do we also condemn such libertarians for “missing the bigger point of human liberty” and for not being sufficiently dedicated to human cooperation and their fellow-man? Where does it stop? What human failing, if any, can we as libertarians tolerate, and why some and not the others? Clearly the answer is that as libertarians we can tolerate any human failing. It is not our goal as libertarians to stamp out human failing. Advocating virtue is the work of priests, gurus and other moralists. Our job is ending systemic oppression and building a system that delivers equal justice to all. Libertarians are not in the business of making judgment calls and deciding the virtue, taste or beauty of actions, but only their justice. In as much as we are true to libertarian theory the worst of us, as well as the best of us are striving for the exact same thing as libertarians — a world without systemic oppression and injustice. Freedom and justice for all. That humans would use this freedom to showcase their failings as well as their virtue, and their good taste as well as their bad taste, is a given. Yet this is not our concern as libertarians. The right of humans to be free of oppression and injustice does not diminish with their human failings. Every human being is fully deserving of full human freedom whatever their aesthetics may be. For libertarians justice for the boorish can not be a less urgent goal than justice for the tolerant, kind and well-behaved. A libertarian who is without libertarian failings is as true a libertarian as any other. His human failings are his own matter, between him and his god. Indeed since a libertarian system delivers the maximum amount of freedom and justice it must maximally mitigate the impact of human failings on the lives of others. Thus even the most personally flawed libertarians are nonetheless working to contain the negative effects of bigotry, boorishness, hatred, meanness, miserabilism and so forth. Nonetheless, we are not battling against human failings, but against systemic failings. We strive for an optimal system, not an optimal human being, society or outcome. Ours is not the quest for a perfect world. As libertarians, we want a world without systemic injustice, not a world without sin.